Navori SA, a leading Digital Signage Software vendor, announces the release of their latest Navori QL Android Player software compatible with the NEC NEC OPS Digital Media Player OPS media player hardware. Navori, where efficient design meets exceptional performance. Navori SA, a leading Digital Signage Software vendor, announces the release of their latest Navori QL Android Player software compatible with the NEC NEC OPS Digital Media Player OPS media player hardware. This ARM-based device features an 8-core graphic card that supports full 1080p resolution. 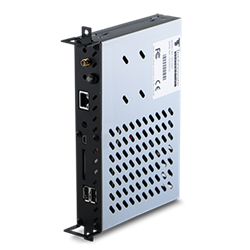 This 20 cm X 12 cm X 3 cm device can be inserted in any compatible NEC display creating a fully turnkey digital signage solution. Mr. Jerome Moeri, Navori CEO says – “As a pioneer in the development of Android digital signage software, we are pleased to see screen manufacturers build Android-based devices that are able to support all the features of our Navori QL software. Customers looking for high-end turnkey products are delighted with this new direction initiated by NEC and soon to be followed by the rest of the market. Navori is Europe's leading provider of digital signage software since 1997. Based in Lausanne, Switzerland, Navori markets its solutions all over the globe from its subsidiaries in Montreal, Buenos Aires and Riyadh. Navori re-invests 25% of its revenues in research and development. The company has led to many digital signage innovations over the years, its latest being the Android QL Player launched in early 2013.